We offer hospitality to all our guests with various services, so that every guest can stay in comfort as much as the guest wishes during the stay. The hotel inside is always decorated with seasonal flowers arranged sincerely with our spirit of hospitality. In addition, matcha (powdered green tea) is served to every guest at the annex. 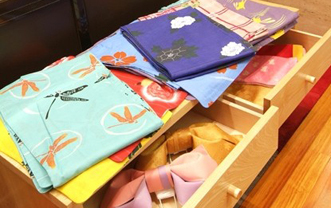 We also have a rent-yukata service that offers a variety of beautiful yukatas that allow our guests to experience elegance of Japanese culture (Yen 500 per unit). If dressing support for yukata is necessary, please contact to the reception counter. You can comfort yourself in the space facing the beautiful garden reflecting the delight of each season. Our skillful therapist refreshes your mind and body by healing hand touches. In Bar Lounge Le Bouquet, you can have blissful time allowed only for adults with Jazz music and alcoholic drinks. If you need instant refreshment during your stay, massage service is available. This place offers Japanese accessories, locally-brewed sake, local products, etc.. This place offers light meals like ramen for the guest who feel hungry in midnights. Club Floor, Karaoke rooms and Karaoke boxes are available. We use LED lights in 80% of in-house lights to reduce more than 40% of lighting-related power consumption.